During the fall of 1938 the Design Group of Aleksandr Yakovlev contemplated a small, twin-engined machine characterized by unprecedented performance. The resulting design No.22 was a classic Yakovlev OKB creation, being very light in both construction and provision, and was remarkably clean and streamlined. The BB-22 prototype's very high performance (it reached 352 mph, with the prospect of higher speeds) masked a considerable number of other difficulties, ranging from inadequate engine cooling to poor stability. Indeed, the continual upward spiral of the machine's weight by various military equipment and stores only exacerbated matters. Great hopes had been placed in the BB-22, and plans were put in motion for production at no fewer than four factories. The attack machine, finally named Yak-2 to accommodate the newer naming convention, failed by some margin to live up to any of the expectations accorded to it, and in the end only Factories 1 and 81 produced any examples of the type, while production was rapidly abandoned. Development of the BB-22 did continue with several proposals powered by the M-105, however, and limited production of the Yak-4 reconnaissance version with these motors did ensue. 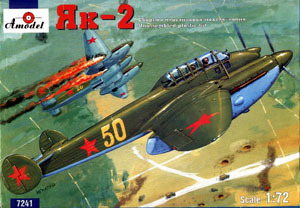 Total deliveries of the Yak-2 and -4 are thought to be 201 aircraft, and 97 machines of these types did see action in the opening phases of Barbarossa. Remarkably, one Regiment (118 ORAP) managed to operate their Yak-4s right through to 1945. 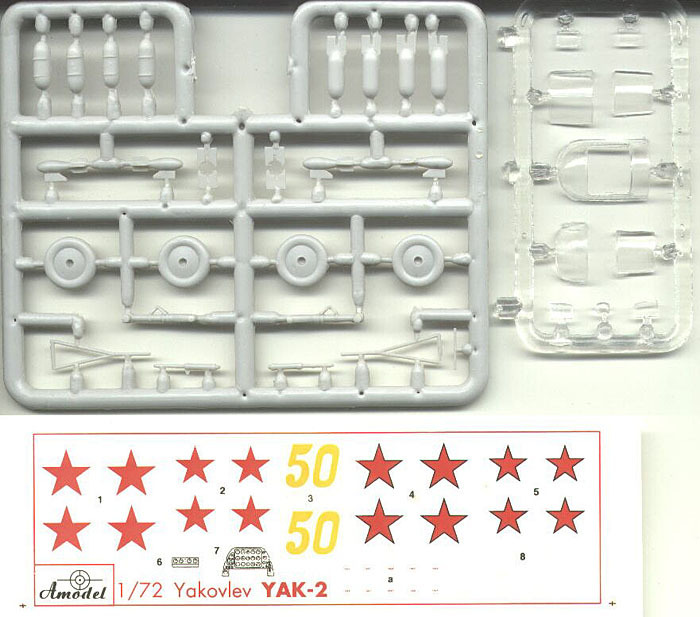 The A-Model Yak-2 consists of 92 gray, injected molded parts with another 10 injected clear. There are decals for two schemes, both Army Green 4B0 over AII Blue. The first scheme is for a Yak-2 of the 316 PAR, Southwest front, July-August 1941, crewed by I. M. Agarkov as commander. The second scheme is a machine of the 136 NBAP of the 19 AD, Southwest front, June 1941. Decals appear matte and in register. The only option with the kit – besides the schemes – is the bomb bay can be modeled opened or closed. While there is a little flash to contend with, and parts are attached to the sprue with large gates, overall this is a stunning kit. The way A-Model broke the parts up it will be easy for them to come out with a Yak-4 – which has been announced for sometime this year (the major differences between the types being the engines and cockpit clear areas). 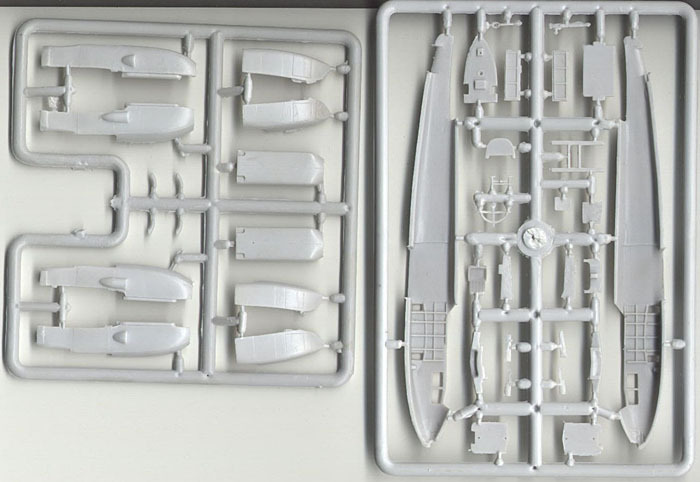 If care is taken removing them from the sprue, the small parts are definitely useable and to scale. 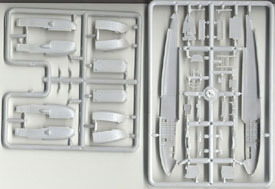 The cockpit is ample for a closed canopy model, but you may want to add some to it if opening up the clear pieces, especially the area for the rear gunner. The biggest disappointment with this kit lies in the clear pieces. They are very thick and a bit distorted. I know I will be replacing them with squashed replacements, and will probably use Kristal Kleer for the pilot’s side windows. If you have had experience with short run kits, then this kit may pose little problems. However, I have yet to build it so I’m not sure how the fit will be. 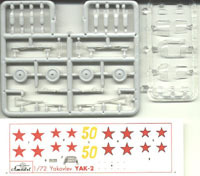 Still, the A-Model Yak-2 is the only kit of the type on the market. If you enjoy VVS aircraft, then by all means pick one up. I am definitely looking forward to the Yak-4 to complete the series. Thanks to Roll Models for supplying the model.